Well let me start by saying I blew it big time this year. For those who were here and wondered I apologize and for everyone else I am sorry for the crappy pictures. This is real life and for as much as I try to seem as if I have it all together…proof that I don’t! Read on to see the hits and misses of the day. The catered food wasn’t being delivered until 4! My husband and brother got back with the cake right around 2:30, just as planned…lol! They both look at me like what is going on, why are people here. I am always ready on time for things like this. Everything is set, down to the last detail and pictures are taken before people arrive. Well, not this year. Most pictures came after the party was over or even the next day. Oh well, I blew it and just have to roll with it because what else can you do at this point. We semi lucked out with the weather. As you get to the end of July and early August you never know what to expect. We had no rain but it was well into the 90s and super windy. Disclaimer: some links may be affiliate links which means at no additional cost to you if you make a purchase I receive a small referral. While there are quite a few options for Hot Wheels party items sometimes I feel like it’s just too much if everything you have at the party is that same theme. 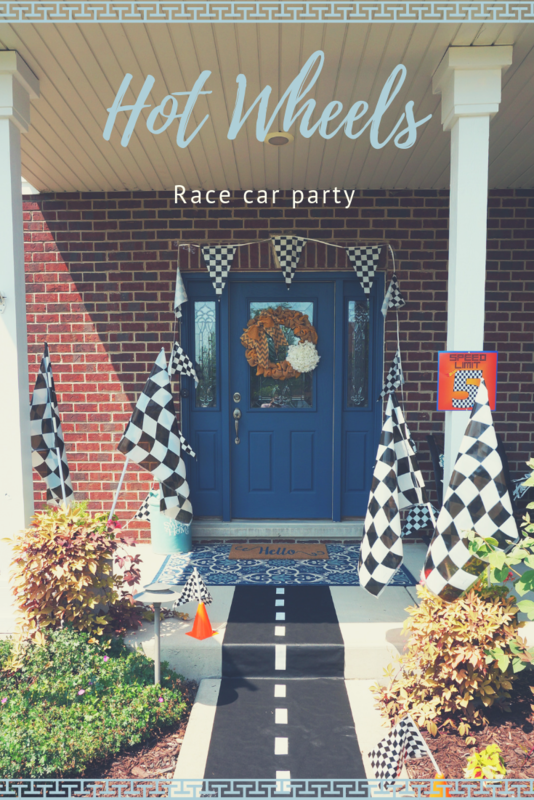 I incorporated the checkered flags and the orange and blue with a touch of Hot Wheels instead of having plates, napkins, cups as well as all decor having Hot Wheels on them. I will start first with the front porch. A lot of these came from Shindigz, they have a great selection and prices too. This wasn’t anything complicated. I just stuck the large flags in the flower pots, taped the banner above the door and laid down the road runner. My husband drilled holes in a few of the cones and I just stuck the small flags in them and added a few along the ‘road’. Next up we have the table backdrop. I’m sorry this picture is so terrible. Remember how my party started? These pictures weren’t taken until the next day and things were falling 🙁 The blue tassle banner is supposed to be hanging up and not drooping like it is in the picture. It was hung in the middle and then draped lower to the sides while the orange was hung with ends high so it draped low like the happy birthday banner. That probably makes no sense in writing. I designed the happy birthday banner and the rest was pretty simple. I made the Hot Wheels happy birthday banner and the backdrop is just an orange plastic table cloth and the checkered plastic roll backgrop. I used command hooks on the ceiling to hang the different orange and blue decorations and balloons so they hung flat against the wall instead of resting at an angle as they would if hung from the wall. Again, I hope that makes sense in writing! The cake is from our usual Creative Cakes. JP picked it out from pictures on Pinterest. One day I needed to get something done at the computer and he wouldn’t leave me alone so I pulled up Pinterest and Hot Wheels cakes on the other computer and told him to find the one he wants. Now anytime he finds me at the computer he wants to look for cakes. The other day he said he wanted to look for Cubs cakes and wondered how we ‘keep’ them to look at later. I showed him the Pin button and before you knew it I had a boat load of Cubs cakes pinned! For the favor bags I took simple blue and orange bags and placed a strip of the checkered duct tape across. With the Print to Cut feature of the Cricut I had cut out the Hot Wheels flame/swoosh and put it on the tape. Simple! Inside I had a Hot Wheels coloring book, pencil and divvied up the contents of a 48 piece favor pack. The centerpiece on the kitchen table was also simple. We all have random vases or glass containers, right? I filled it up with cars and stuck a bunch of flags in it. Again, this picture was taken after the party so when I originally put it together you couldn’t see the flag sticks. With a summer birthday he celebrated his birthday the last week of school. This somewhat helps us with theme prep because I start asking him in April what he wants to do so I know what to send to school. Hot Wheel pencil’s are pretty easy to find so I did a cute ‘write’ on tag. I realized that my trimming of this tag was way off, that’s probably why it was left behind and not sent to school! I totally forgot about the tags until I was writing this post so the favor bags for the party just had plain pencils. Once again, oops messed that up too! I wonder how old is too old for the fun birthday shirts. This could have been the last year at least for this style. We will see how we all feel next year! I ordered the shirt from Etsy, she was super easy to work with on picking the colors I wanted and it came quickly. I’d seen the complimentary Pit Crew shirts on Pinterest and Etsy but I made them myself. The party had pretty much ended, it was just my family and our neighbors so we opened up the pool. At the last minute I remembered we didn’t have a picture with us all in our shirts so we just threw JP’s on over his swim gear for a quick picture. I even found a race themed bounce house! A friend recommended a place and they were super, super reasonable. It also came with 2 tables and 12 chairs. They dropped it off Friday afternoon and picked it up Sunday afternoon. That long isn’t guaranteed though, I think it just depends on their schedule and route for other rentals 😉 It was very clean too. Party Rentel el Cuate. The kids played stick the tire on the truck. They were all very excited and none of them had ever played pin the tail on the donkey. I didn’t spin them, I figured first time playing and not sure how they would react to the blindfold that I’d just let them try to walk straight ahead. Most of them got a lot closer than JP did…lol! I’m not sure how I feel about the new pinata’s that you just pull a string. Part of me says oh good because you don’t have to worry about kids swinging a stick and hurting someone. However, this removes the whole fun of a pinata. Also, it’s another thing done to ‘protect’ kids. Do you remember lawn jarts or the materials simple board games were made of? Nothing is the same anymore, jarts are like a round ball, board games and marbles are all plastic. I’m sure it’s a combination of safety and BLP but sometimes I feel the whole safety issue gets a little extreme. For the next one we may still break out the stick even if it has the pull tabs. Have you ever done a photo booth and never had anyone use it? I did! Fail number 92,207 for this party. It had been so windy that by the time I got Joseph out for a picture it was all broken apart. We propped it up enough to get him in a picture. To make this we happened to have a very large box so I hand drew it and cut it out with the utility knife. I spray painted it blue and had some black craft paint on hand for the tires. I did the licence plate and lights in Design Space and used the Print to Cut again and cut the flame and letters out with the Cricut too. This is what the wind had done to it! It was so hot and windy that no one spent any time outside other than when I dragged kids out for games. The kids ran in and out of the bounce house but no one else was outside. The umbrellas kept blowing over and these table cloths had a ton of tape on them yet still blew off. I always put too much pressure on myself for these parties. I know it. But it’s something I enjoy doing. After so many years of hosting holidays and parties I’ve relaxed a lot on my obsessive planning and this year bit me in the you know where. Everything was still fine but I was scrambling when people got here and I did not get very good pictures. I suppose there’s no such thing as a failure unless you don’t learn your lesson, right?